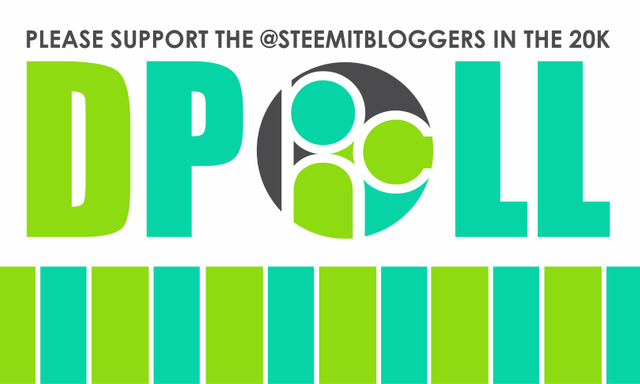 Show @steemitbloggers your support in the 20K delegation contest, enter to win 1 Steem! The last time I did a Steem raffle like this, I only published it on the Steemit blockchain, thinking my WordPress friends and general readers wouldn't be interested in it. This time, I've decided to also post this on my blog, because I want to show everyone how incredibly awesome and supportive the Steemian community can be! So, if you've spent any time on the blockchain, Twitter, and/or Discord this week, you've probably bumped into someone talking about @theycallmedan's new contest that is rewarding the winner with a 20K Steem Power delegation for one year (which is double the prize of his first delegation contest). Speaking of that first contest, while we gave it all we could, the amazing @VotoVzla community from Venezuela pulled out in front, and easily crossed the finish line. The wicked cool thing? All of the other nominees, especially the other two front runners (our group and @Team-CN) were cheering them on and congratulating them on a well-deserved win! "With all due respect to our honorable competitors, we are truly multinational. We have members from 24 different countries, including, India, Philippines, Belgium, Ireland, Russia, Wales, Malaysia, South Korea, England, South Africa, USA, Scotland, Denmark, Australia, Netherlands, Canada, Uruguay, Croatia, France, Indonesia, Germany, Slovakia and Bulgaria." So, to make a long story short (yeah, I know - that ship has sailed...LOL), I thought I'd do another list of all the support posts that have found their way onto the blockchain this week. I'm also going to give a little appreciation back by having a random drawing for ONE STEEM for all the non-steemitbloggers Steemians who've taken that extra step to support us! How to enter to win 1 Steem! When the delegation contest ends, I'll choose ONE non-steemitblogger support post at random & send them ONE STEEM as a THANK YOU! This time, I'm also offering a secondary prize to my @steemitbloggers family, in the form of a tip. When the delegation contest ends, I'll choose FIVE @steemitbloggers posts at random & give them a @tipU tip as a THANK YOU! Like last time, I'll be choosing the winners using the generator over at RandomResult.com. Oh, and if you haven't heard of @cardboard's amazeballs Steemit tipping service, check it out HERE. NOTE REDUX: As I was writing this today (Sunday), there were already 54 support posts published. Just to be clear, while I've included my own support posts so the number is accurate, needless to say I'm not putting my name in the drawing...LOL! Please shout out with a link if you find/have one not listed here! I was straight onto voting for the group in both polls. We need that delegation so the community can keep growing as will the members with great content! Magic Dice has rewarded your post with a 5% upvote. Thanks for playing Magic Dice. Yes absolutely @goliath! And every little bit of support counts, so thank you for yours! I've not heard of this 20k delegation contest... hmmm, there is no-one talking about it on any Discord servers that I've seen... (pssstt... don't tell @jaynie or @zord189!). Heh... I have a comfy rock that I'm hiding under! This just upped your status to SUPER QUEEN of support confirmations!! 👑👸 That's some serious work to get all those compiled, so thank you for making it so easy for us all to spread the dpoll post love! WOW ... now THAT's a Reading List! Hello @traciyork! This is a friendly reminder that you have 3000 Partiko Points unclaimed in your Partiko account! I hope we win! Good luck to us!